How Doctors Diagnose and Treat the "Funny Bone"
The ulnar nerve is one of the major nerves of the upper extremity. Nerves are structures that allow information to travel from the brain to the periphery of your body, and nerves can also send messages back to the brain. Nerves in the upper extremity carry important information about sensations that you can feel, and movements that your brain wants your body to make. When nerve function is impaired, people may experience symptoms of pain, weakness, and abnormal sensation. The ulnar nerve is one of several major nerves that supply the upper extremities. The ulnar nerve is formed by the coalescence of several major nerve fibers in an area around the shoulder blade called the brachial plexus. Upon exiting the brachial plexus, the ulnar nerve travels down the arm supplying information to some of the muscles of the forearm and hand, and provide sensation information to specific areas of the hand. Tingling and numbness (commonly referred to as paresthesia) is a sign that nerve signals are being disrupted. Often this is because of pressure or inflammation around the nerve. The location of the paresthesias is not always the location of the problem that is causing dysfunction of the nerve. For example, in the case of cubital tunnel syndrome, the most common location for paresthesias are in the hand—specifically the ring and small finger. However, the location of pressure on the nerve is near the elbow joint. Pain can be a symptom of many medical conditions, and differentiating pain coming from abnormal nerve function can be difficult. Often the pain associated with a nerve condition is also associated with paresthesias as described above. In addition, the pain associated with abnormal nerve function is often experienced as a burning sensation that radiates along the path of the nerve. People with nerve pain often described shooting or electric shock types of pain. When nerve function is impaired, the brain has difficulty communicating to activate specific muscles. This can be experienced as a weakness of those muscles. In the acute setting, this may be experienced as difficulty with specific activities or strength maneuvers. For people with ulnar nerve injuries, they may have difficulty pinching or grasping objects. In the chronic setting, people who have long-standing nerve compression may experience wasting away of the muscles called atrophy. This is generally an irreversible problem and is seen by noting areas where the body has lost its normal muscle mass. This may be seen in people with ulnar nerve injuries as a wasting away of the soft tissues of the hand. Holding both hands side-by-side may make signs of wasting more apparent. Not every individual with a nerve injury or condition impairing normal nerve function will experience all of these symptoms. Most often, people are bothered most by one of these symptoms, and may not even notice the others at all. Other people will have multiple signs of nerve dysfunction. A careful examination will help identify signs of nerve dysfunction, even if they are not experienced as a typical symptom by the individual with the problem. Injuries to the ulnar nerve can occur at multiple points along the course of the nerve. Sometimes injuries occur as an acute injury, where there is a sudden traumatic injury that causes damage to the nerve. Other times, nerve problems can be the result of a chronic, long-standing condition that causes gradual deterioration of nerve function over time. Some of the more common locations and mechanisms for ulnar nerve injury include the following conditions. Cubital tunnel syndrome is the name used to describe chronic compression of the ulnar nerve behind the elbow. The actual location of compression of the ulnar nerve in people with cubital tunnel syndrome can vary and has been described as compression coming from a number of different structures behind the elbow. In this location, the ulnar nerve wraps directly behind the humerus bone along the back of the elbow joint. Different structures including ligaments, blood vessels, and tendons have been described as the source of compression in the cubital tunnel. Cubital tunnel syndrome is categorized as a compression neuropathy of the upper extremity. This condition is the second most common type of compression neuropathy, after carpal tunnel syndrome. Guyon's canal, also called the ulnar tunnel, is a location within the wrist that contains the ulnar nerve. Compression of the ulnar nerve in this location can occur as a result of fractures to the small bones of the wrist, ganglion cysts forming within the wrist, or pressure commonly found in cyclists when they grip their bicycle handlebar. The most common reason for nerve compression in Guyon's canal is so-called "handlebar palsy" when cyclists experience pain and numbness when the nerve is pinched against the bones of the wrist and the handlebar of a bicycle. This is the reason why many cyclists wear padded gloves when gripping the handlebars. If padded gloves do not adequately relieve symptoms, changing your grip or changing to a different style of handlebars can often relieve the symptoms of numbness and tingling that tend to occur when compression is applied to this location. The funny bone has been the name people use to describe contusion injuries to the ulnar nerve behind the elbow. In this location, the ulnar nerve wraps behind the arm bone (humerus) just underneath the skin. There is very little soft tissue protection around the ulnar nerve in this location and striking this part of the elbow against an object often causes sharp pain, tingling, and numbness along the ulnar nerve. This is the sensation that people described when they "hit their funny bone." Traumatic injuries occur as the result of sudden, often violent damage to the nerve. Traumatic injuries can occur as a result of many different problems. Some of the more common mechanisms include nerve contusions, lacerations, and concussive injuries. Nerve contusions typically occur after a fall or motor vehicle collision. 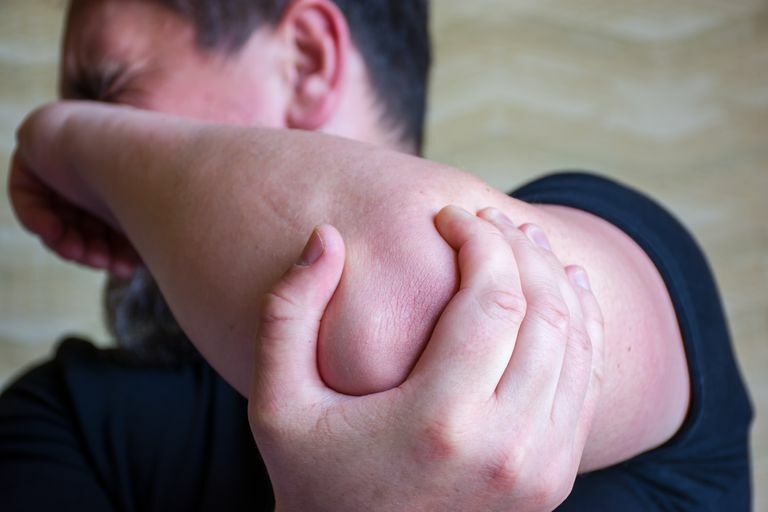 Since the ulnar nerve is located close to the skin, direct trauma to the overlying skin and soft tissues can cause a contusion injury to the nerve. Lacerations can be caused by injury from broken glass, knife wounds, and other sharp objects. Concussive injuries to the nerve can be caused by injuries where the nerve may not be directly damaged by a bullet fragment but injured as a result of the concussive force of the gunshot. Making a diagnosis of any nerve disorder requires a careful understanding of the symptoms experienced by the patient, a thorough physical examination to test the function of the nerves, and a complete understanding of the anatomy of the human body to help localize the source of the nerve dysfunction. One of the amazing things about the nerves in our bodies is that, except in very rare circumstances, they provide the same patterns of sensation and muscle involvement in just about everyone. The ulnar nerve very predictably provides sensation in the exact same area for almost everyone: the small finger and half of the ring finger. Knowing these patterns of nerve function can help a skilled examiner locate the source of the problem. Many examination techniques are used to isolate and test nerve function. One specific test used to examine people with suspected nerve abnormalities is called Tinel's sign. A Tinel sign is considered positive when the examiner taps directly over the location of nerve abnormality. The symptoms produced by this maneuver should re-create symptoms of paresthesias and discomfort along the path of the nerve, not at the specific location where the tapping takes place. For example, a positive Tinel's sign in a patient with cubital tunnel syndrome would re-create symptoms of paresthesias and pain in the ring and small fingers by tapping behind the elbow joint directly over the ulnar nerve. A number of different studies can be used to assess the ulnar nerve, and also assess the surrounding anatomy which may be causing compression or injury to the ulnar nerve. A regular X-ray can be helpful if there are concerns about deformities of the bone, bone spurs, or other abnormal structures which could be causing irritation to the ulnar nerve. Other imaging modalities including MRIs and CT scans are less commonly needed to assess an ulnar nerve problem, but may also be helpful especially if there is a concern for a possible soft tissue cause such as a ganglion cyst, tumor, or other soft tissue mass that could be causing compression on the nerve. High-resolution ultrasound is being used more commonly given that it is noninvasive and relatively quick and easy to perform. However, ultrasound examinations are highly dependent on technician experience, and not every facility has the capability to examine the ulnar nerve with ultrasound. Electrical studies of the nerve include measurement of nerve conduction and electromyography (EMG). While these studies can be helpful in locating the source of a nerve condition, they can be uncomfortable for patients as they involve placing needles into the skin and measuring an electrical current along the path of the nerve. Nerve injuries are notorious for being challenging diagnostic problems to figure out. Often, determining the location of a nerve injury can be very straightforward (for example after a penetrating injury), or it can be exceedingly challenging. It is essential to work with your doctor and allow the diagnostic workup to unfold. Often the evaluation and treatment of nerve-related conditions is not a simple one-step visit to the doctor's office. Sometimes, multiple different types of physicians work together to determine the source of a nerve injury and help determine the most appropriate treatment for that problem. People with nerve injury problems may be seen by their primary care provider, orthopedic surgeons, neurosurgeons, neurologists, physiatrists, and other specialists to help determine the most appropriate treatment for a specific condition. The only way to achieve effective treatment of any nerve condition is to understand the exact location of the source of the problem. This may sound straightforward, but often the symptoms of the nerve problem are not experienced at the location of the damage to the nerve. Trying to decipher the location of the problem often takes some time and testing, but is essential in order to achieve effective treatment. In almost all nerve damage situations, the most important initial step is to find ways to relieve pressure and tension on the nerve that is injured. This may be as simple as avoiding specific activities that cause pressure on the nerve, it may involve the use of immobilization to limit movement of the nerve, and sometimes involves padding for protection to keep pressure off of the nerve. If a component of the compression on the nerve is the result of inflammation, treatment modalities that address inflammation can be helpful. Sometimes these treatments include topical anti-inflammatory measures (ice application), oral anti-inflammatory medications (nonsteroidal anti-inflammatory medications), steroid medications (including oral medications or cortisone injections). Surgical treatments for ulnar nerve problems depend on the type of injury to the nerve. When there is a direct injury to the nerves such as a laceration, these injuries are often repaired soon after the injury. Sometimes if there is a broad area of damage to the nerve, nerve grafting may have to be performed in order to reconnect healthy portions of the nerve. When there is compression on the nerve, surgical solutions are aimed to not only relieve the pressure but also remove tension from the nerve. In some cases, this is as straightforward as removing pressure on the nerve in a minimally invasive procedure. Or, this may include relocating the position of the nerve so that there is less tension on the nerve. A common treatment for people with cubital tunnel syndrome is to move the nerve from the back of the elbow around to the front of the elbow so the nerve is no longer under significant tension when the elbow is bent—this surgery is called an ulnar nerve transposition. The ulnar nerve is one of the major nerves of the upper extremity and is of critical importance to providing information to the forearm and hand muscles from your brain, and returning information about sensations from the extremity. Abnormalities of ulnar nerve function can occur for a variety of reasons. Determining the source of damage to the ulnar nerve is important in order to allow for proper treatment. Often, the location of nerve injury is distant from the location of symptoms experienced by the individual with the ulnar nerve problem. Treatments range from simple steps to relieve pressure on the nerve to more invasive surgical solutions. Why Are Cortisone Shots Used?